The Moviesite - Schuks! Pay Back the Money! 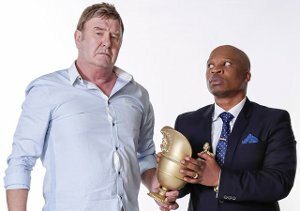 After losing rugby's holy grail, the Currie Cup trophy, Schuks sets off on a hilarious journey to pay for his sins. The Sports Minister offers Schuks a lifeline to create a documentary film that shows South Africa in a positive light, in lieu of a R 1-million fine. 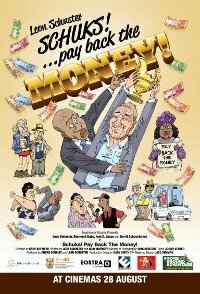 As the documentary takes shape, the trophy traverses its own perilous journey as it moves from two clueless crooks to an enterprising traffic officer, as well as a conniving pawnbroker, among others. True to form, the 'documentary' features a series of hidden camera gags, featuring unsuspecting South Africans and a host of famous personalities and celebrities. But it's just a piece of tin!